Ryoma was not opposed to boasting, and he had a big ego, declaring to his sister: "It's a shame that there aren't more men like me around the country." For all his boasting, however, Ryoma was also a realist. "I don't expect that I'll be around too long. But I'm not about to die like any average person either. I'm only prepared to die when big changes finally come, when even if I continue to live I will no longer be of any use to the country. But since I'm fairly shifty, I'm not likely to die so easily. But seriously, although I was born a mere potato digger in Tosa, a nobody, I'm destined to bring about great changes in the nation. But I'm definitely not going to get puffed up about it. Quite the contrary! I'm going to keep my nose to the ground, like a clam in the mud. So don't worry about me!" It seems that Ryoma was also an incredible visionary who foresaw his own destination. Four years later the "nobody" from Tosa forced the peaceful abdication of Shogun Tokugawa Yoshinobu, and the restoration of the emperor to powerthe event that historians call the Meiji Restoration. But how could Ryomawho had plunged from the status of "nobody" to that of outlaw and one of the most wanted men on a long list of Tokugawa enemiesbe of sufficient consequence to force the abdication of the generalissimo of the 267-year-old samurai government? And what were his reasons for doing so, even at the risk of his own life? To answer the second question first, and to put it quite simply, Ryoma was a lover of freedomthe freedom to act, the freedom to think, and the freedom to be. These were the ideals that drove Ryoma on his dangerous quest for freedomwhich, of course, was nothing less than the salvation of Japan. 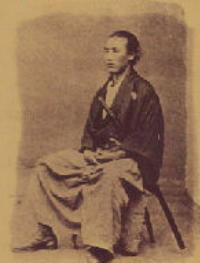 But the greatest obstacle to this freedom, and to the salvation of Japan from foreign subjugation, was the antiquated Tokugawa system, with its hundreds of feudal domains and suppressive class structure, which men like Katsu Kaishu and Sakamoto Ryoma meant to replace with a representative form of government styled after the great western powers and based on a free-class society and open commerce with the rest of the world. While Ryoma was painfully aware of the necessity to eliminate the shogunate, the means for revolution eluded him. Having abandoned Tosa, he was a ronin, an outlaw samuraia status which at once aided and confounded him. Unlike his comrades-in-arms from Choshu, Satsuma and other samurai clans, he was not bound to the service of a feudal lord and clan. On the other hand, he did not enjoy the financial support and protection of a powerful feudal domain. After much trial and tribulation, and as his first giant step toward realizing his great objective, Ryoma devised a preposterous plan of convincing Satsuma and Choshu to join forces with one another as the only means to topple the shogunate. But Satsuma and Choshu were bitter enemies whose hate for one another surpassed even that hate which they had historically harbored toward the Tokugawa. What's more, the braggart Ryoma had a reputation for exaggerating. When he told his friends of his plan, some initially dismissed it as so much "hot air," while others simply thought he was crazy. But in addition to many other talents, Ryoma, a truly Renaissance man, was endowed with an uncanny power of persuasion. After a year of planning and negotiation, in January 1866, Ryoma, now an indispensable "nobody," successfully brokered a military alliance between Satsuma and Choshu, which more than anything else hastened the collapse of the Tokugawa Shogunate. Although the shogunate had not yet learned of the secret alliance, Tokugawa police agents strongly suspected that Ryoma was up to no good. On the night after the alliance was sealed in Kyoto, Ryoma was ambushed by a Tokugawa police squad, as he and a samurai of Choshu, who had been assigned as Ryoma's bodyguard, celebrated their great success in a second-story room at Ryoma's favorite inn, the Teradaya, on the outskirts of the Imperial capital. A young maidservant at the inn, named Oryo, had been soaking in a hot bath when she heard the assailants break into the house. Oryo immediately ran from the bathroom stark naked up the dark staircase to warn the two men upstairs. The scene is a very famous one, as is the ensuing battle, during which Ryoma wielded a Smith and Wesson revolver and his bodyguard wielded a lethal spear to fend off their assailants and escape through the back door. Equally famous is the wedding between Ryoma and Oryo, which took place soon after, and their subsequent trip to the hot-spring baths in the Kirishima mountains of Satsuma, which was supposedly the first honeymoon in Japan.